On another note, I just wanted to post the latest work created by yours truly. Most of the papers on this project are from Donna Salazar‘s latest lines. …and that pretty lace is one of the many Kiki Art embellishments. To tell you quite honestly, this project was totally outside of my box. If you have seen my gallery, you must know that I’m a big fan of the vivid and bold colors. Working with vintage looking products is always a challenge for me, but I’m glad I tried. It never hurt to try, right?! I found a way to organize my mini alphabet stickers! I created a book with my bind-it-all to store these stickers. 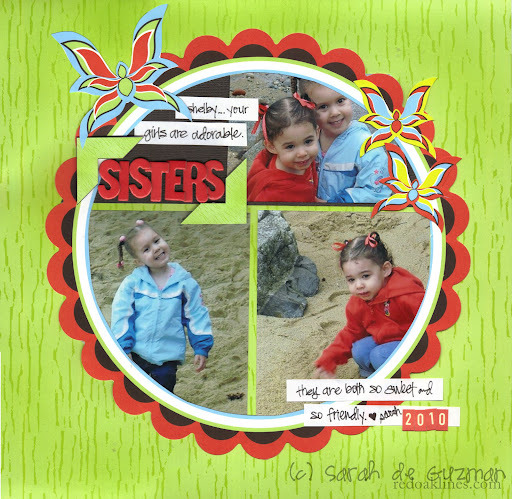 For details on these projects, go check out my March gallery over at Zutter Zisters. Now, for the fun stuff… stuff created for YOU and YOU and YOU. 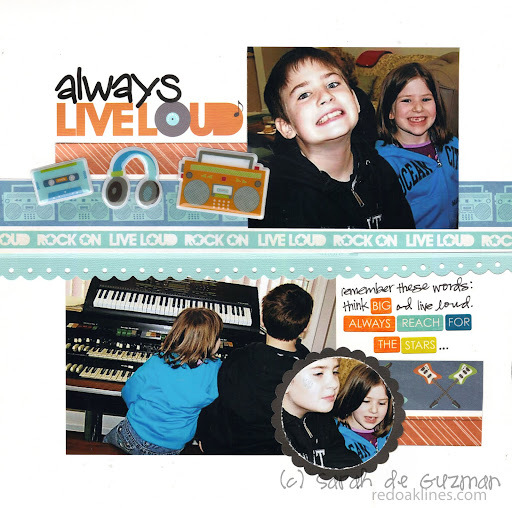 The following two layouts highlight Imaginisce‘s Live Loud. When I received my DT box, I was so excited to start using it. It’s such a fun line to use. Really, it is! 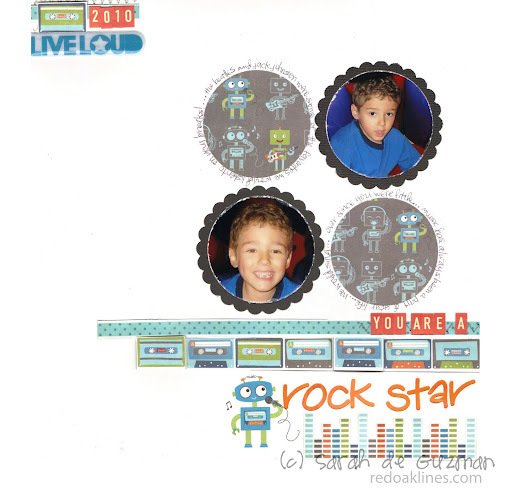 …and last but not least, this one was created for Leisa and her son, Jaren. Jaren Beedee, I miss you. Let’s hang out soon, okay?! I feel slightly nervous. Is this normal?! Well, I guess it is for me considering I have anxiety disorder. Holy crap, you’re 26 this year and I’m 29. Remember when we were kids and we used to climb up on the stove so we could microwave burritos and then we’d close the vertical blinds when we watch Lil’ Bits? Waw, what a fantastic way to store thos mini alphas. I should make one too. The only thing I wonder about is how you made the cover. Your top project is just wonderful! Love the vintage feel and those flowers! As for the layouts, fab as always! Erin is going to love that one with her kiddos! I love all of these projects. Boy do I need something to store my alpha stickers. That is a great idea!! my favorite gotta be your sticker album! brilliant! Love your layouts – and your idea for the alphas is great – I don’t have a bind-it-all so I will have to figure something out – hmmmmmm. And you know what – we are doing a birthday countdown over at Scrapgal because one of the DT will be turning 40 this month and we have at least 2 other birthdays. We are doing fun stuff every day for the countdown. Hope you have a great week! p.s. no pix of the puppers? Oh how I remember 26….. this month will be 34 for me. Huh…. that just sounds ….ummmmm…..I am having a senior moment…..hahaha. hi ate sarah, soji asked me to open her facebook account because you sent her a message and can’t open it..prolly i’ve seen your fantastic layout for elijah first..=)YOU REALLY ARE SO AMAZING! !could you create something for me too?ahihi! Golly, I remember being 26… it was a very good year… veryyyyyyyyyy long ago… but it was oh so fun… enjoy every moment… and don’t worry about the clock ticking… don’t worry about what is ahead… or when something will happen… it only makes you anxious… and who wants to live life like that… Life is to be lived!!!! Enjoy every moment!!! Now you ‘rocked’ those layouts… I loved them all!!!! the project is wow… wonderful…. and the letter book… ummmmmmm it’s fab… still jealous of all the stickers… but I’ll get over it…. lol!!! omg…you’re going to be 26 and i’m going to be in my late 20s! NOOOOO!!!! NOOOO!!!! I swear just the other day, I was still in college taking those tercero golf carts on a joy ride. HAHAH. FML. love your LOs. Makes me happy. I thankfully have about a 10 hr work day today compared to the 14 hour workday i had yesterday. You’ve inspired me, Sarah!! I have NO ARTWORK hanging in my office, just smaller things tacked to my cubby wall, and I have a giant wall behind me and to the right at my disposal. Shameful! Love love love the alpha storage binder you made… you are so darn creative! Inspiring work, as always, Sarah! Loving all the fun LO’s & such great designs, too! Hope it’s a GREAT day! i take it you all LOVE that mini! i’m glad you LOVE it! 🙂 i’ll have more details on it on the binditall blog very soon! 😉 stay tuned. you may be on of the busiest and most productive scrappy girls that I know. 26..wow that was a long while ago for me. This year I will turn 40. Anyway I love your creations and have to say you have many fortunate people around you..you are very giving with your crafts! Very nice! wow… that wall hanging is GORGEOUS!! you did an amazing job!! i totally love the alpha book too… super cute idea!! and i way love the design on your LO’s as always!! love the mini album for your alphas, that is such a great idea! Sarah, that alpha organizer is genius, seriously delightful idea! For not being a vintagey girl you sure did rock that wall hanging! I know what you are saying though because I too love bright fun colors as opposed to softer ones. LOVE the other LO’s too and how fun is that alpha book?? Girl you are on fire! 26 isn’t that bad Sarah! I turn 30 this year in April. Ugh! I loved all of your projects, but that alpha storage was to DIE for! Wow! Wow Sarah! LOVE LOVE LOVE The alpha album, yummma!! Adore all your creations, happy birthday month countdowning!!! another batch of fabulous projects!! Love your LO’s and I love the wallhanger and that alphabook is such a great idea!!!! I just ordered some of the Scooters vacation line!!! Your wall hanging is gorgeous!!! Love all of your scrappy projects! That wall hanging is fabulous Sarah and I looooooooove the alpha organizer, such a clever idea! Love stopping by your blog, so much inspiration!! love the letters organizer and that door hanger is mad awesome!!! hey girlie! happy bday month! well, for creating outta your comfort zone, that looks gorgeous! i’m loving those hang it thingys! and all those layouts! wow! it’s never NOT WOW when I visit the bloggy! so, r u having your party on pacquiao fight night like me? my parents decided it was a great excuse to have a party. hah hah! their such party animals! I looove your new layouts, that alpha book is GENIUS, now I need to make myself one of those! Bwah! You’re funny…to be 26 again. Eek, not sure I’d do it. 🙂 Love all your stuff, Sarah! Happy birthday month! 🙂 I love that sticker organizer!!! Great idea! And just turn up the music to drown out that biological clock.